Hello hot cross buns, hello chocolate, and most importantly…hello 4 day long weekend. We decided to take advantage and head for the hills. 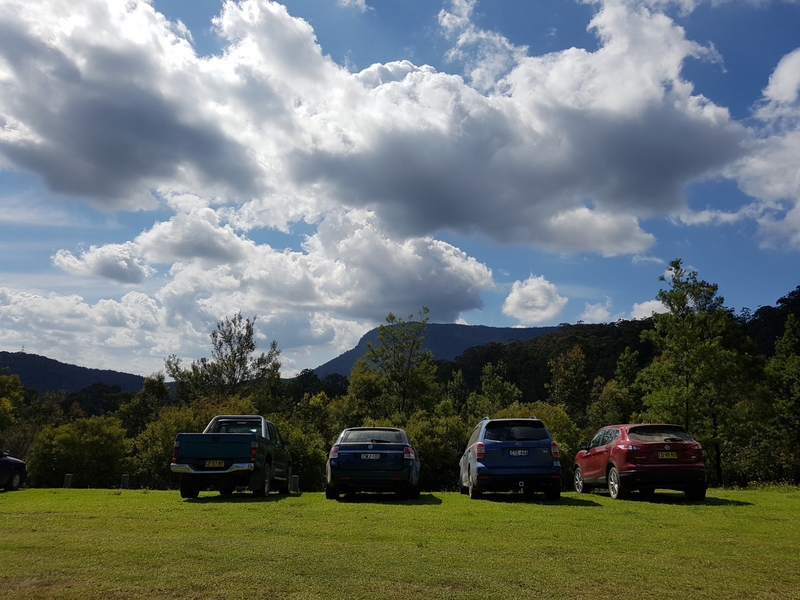 Cue Gimace, into the garage, transferring all the camping gear into the car…Theverymoodyhousehold with (along with Aunty @atlasandtracks) headed up the mountain to camp for two nights in the autumnal heaven that is The Megalong Valley, Blue Mountains. 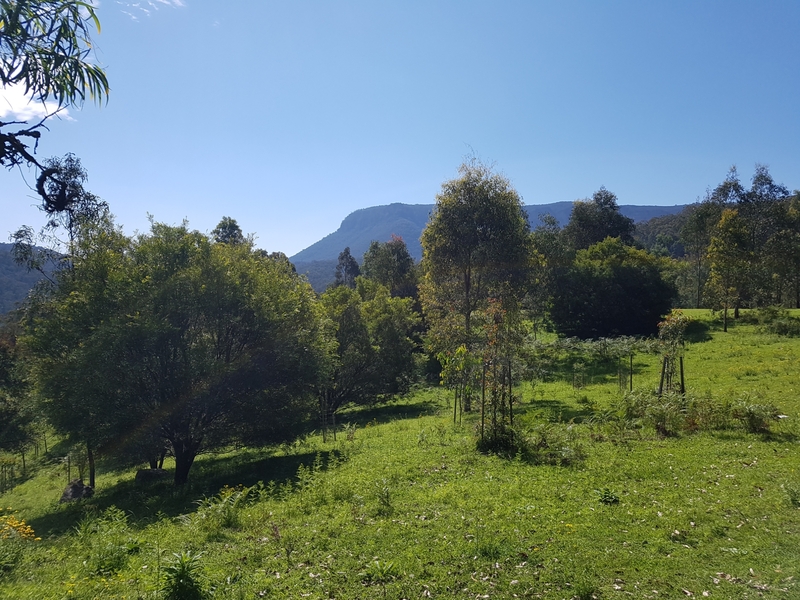 Warm and sunny days, bookended by clear, crisp mornings/nights; Beautiful grassy camping area, populated by kangaroos and an abundance of birdlife; an awesome remote location, conveniently rather close to home (meant Grimace could meet us there after work). It all sounds rather perfect! The boys, Aunty @atlasandtracks and I headed up Saturday morning, with approximately one -zillion stops on the way (for all those “forgotten” items). 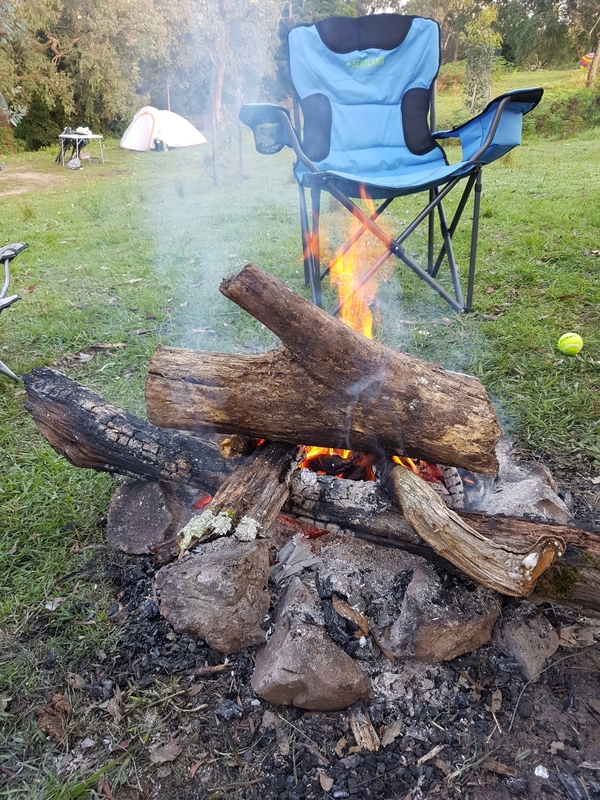 The traffic was madness and we were itching to nab a spot at Dunphys camp site – unable to book, we were feeling intimidated by the chance at missing a spot on the busiest weekend of the year. 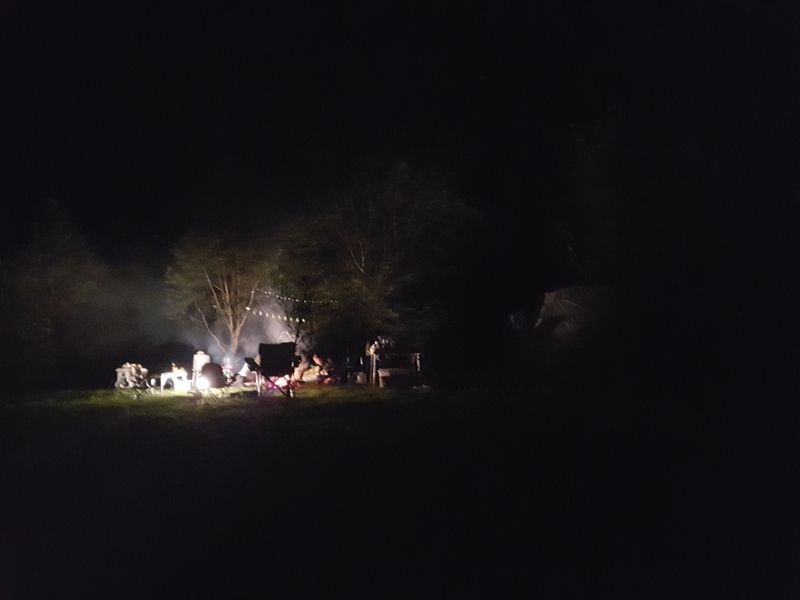 We arrived at just the right moment and were able to snag a spot with just enough flat for our tents and a little fire pit. 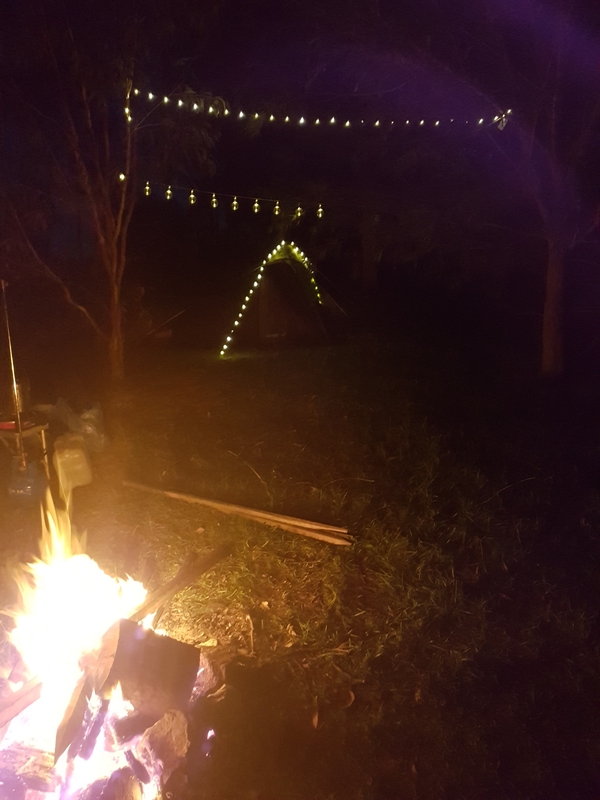 For those of you who’ve been camping with kidlets, you’ll know the chaos and effort you have to endure to get a camp site set up… well, I’d love to say that my angels bucked that trend and made it easy to get set up, but that wouldn’t be quite true. Their “helpfulness” was at times helpful, and others just plain soul destroying. 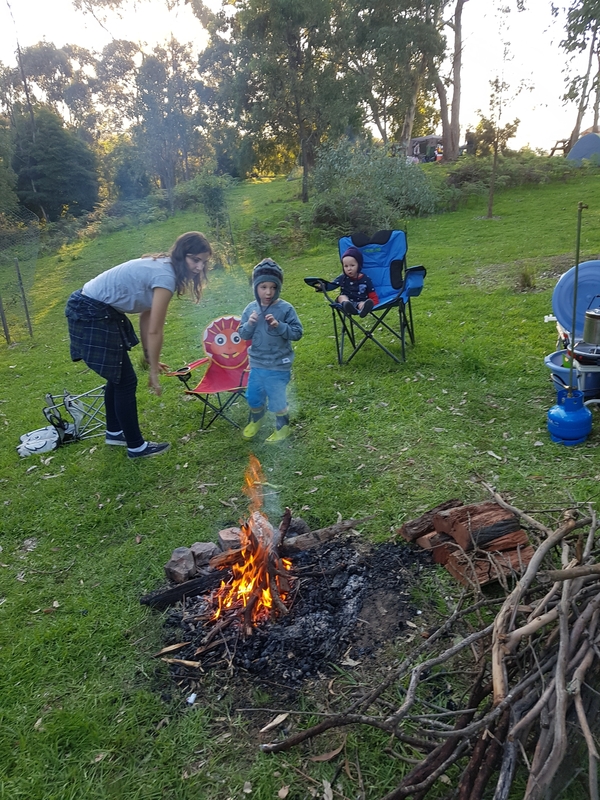 Nonetheless, we got our tents set up, beds assembled, houseload of packed things unpacked, dinner on to cook and Aunty @atlasandtracks collected enough wood to get the fire raging. 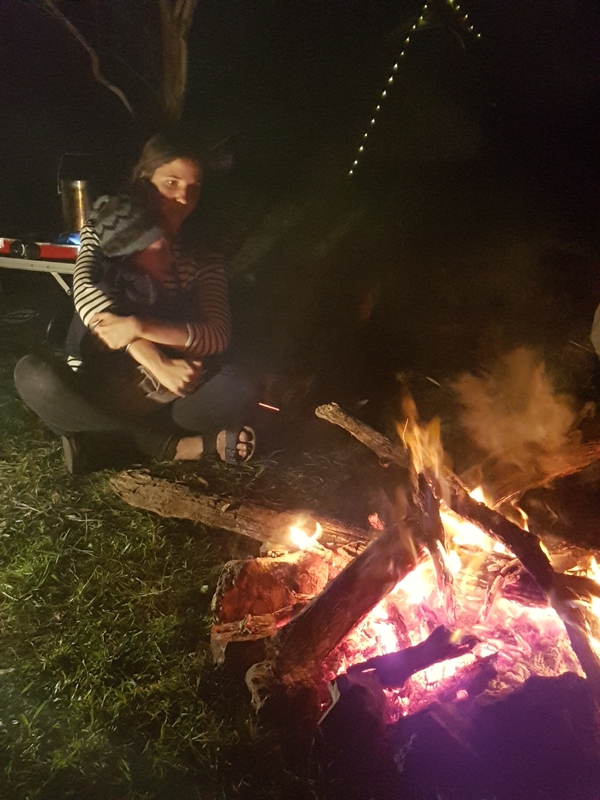 Sitting around the fire that night, we promised ourselves we would enjoy the serenity of camping the next day (we also dubbed the term Two-oist; referring to the mistake of attempting to reason with a two year old). Well, wouldn’t you know it – day 2 felt even crazier when it started nicely at 6am: Giggles Magoo loudly discovered the Easter Bunny/Bilby had no trouble finding our remote location and Little Mate decided to serenade a tent filled with a no-doubt sleeping couple, just to give them that special start to their day. Chocolate was the fare of the day, interspersed with candy from an American family camping just over from us. Giggles Magoo assumed his position in their family when he realised all the chocolate had disappeared from ours, which left Little Mate a playmate down, meaning he reserved those sugar meltdowns for his number one lady…me. After a few cuddles, a coffee and the idea of an adventure (read: head back up the hill into Blackheath to collect some supplies: food, water and gas…you know, all the essential things you’d probably take in abundance) we were all ready to face the day again. 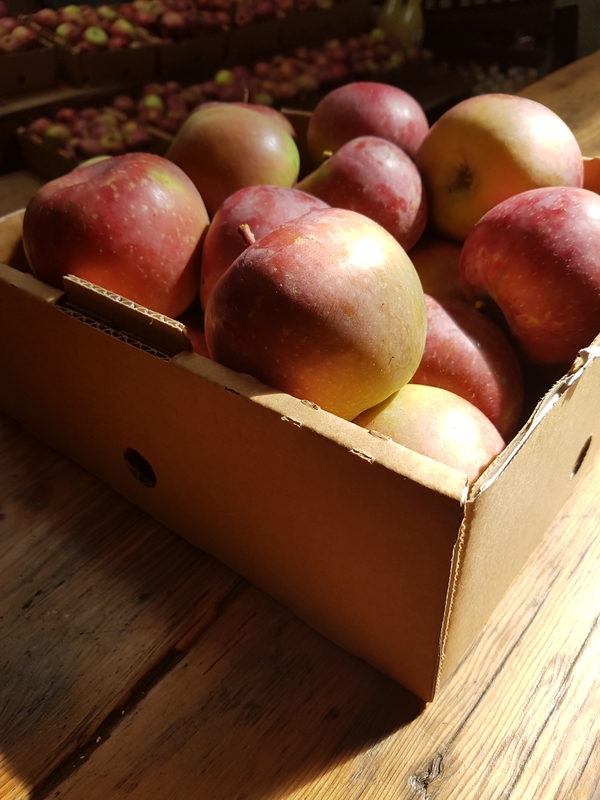 Up in Blackheath we found the boys’ Gra and Grumps, and we all paid a visit to the magical Loganbrae Apple Orchard. The spiced apple juice, the deliciously crunchy apples and the view set.the perfect scene for us to regather our sanity and brave the rest of trip. Back at the camp ground, Giggles Magoo’s motley crew of camping buddies grew exponentially and he ran around enjoying the freedom little boys dream of: stick fighting super-heroic ninjas. It was really sweet to see how social he can be, but also his imagination at play. 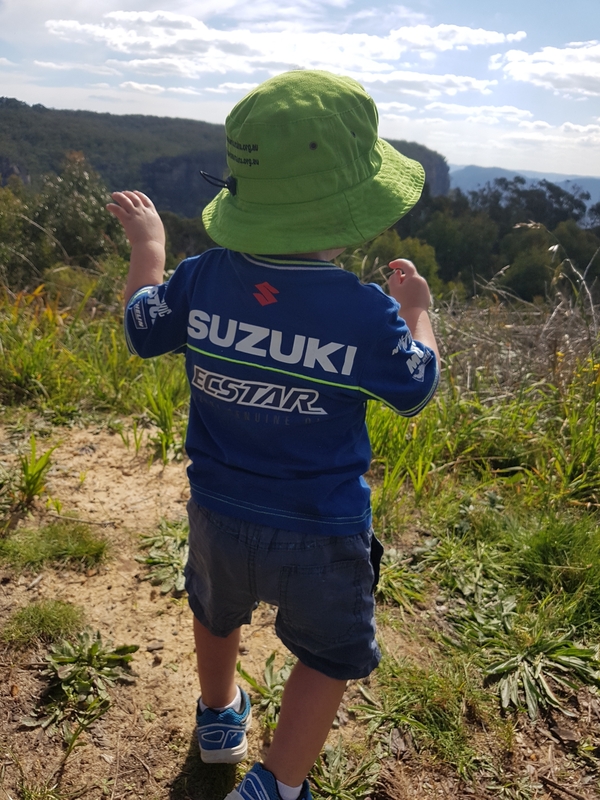 It was even sweeter to see Little Mate getting the confidence to join in at times with the big boys. Waking up on Monday morning wasn’t as dramatic as the previous morning, and the gentle start to the morning meant I delayed all feelings of pack-down blues until after our delicious bbq breakfast. Pack down continues to be the hardest thing about any trip, however I feel this one went pretty well, helping me to focus on gratitudes from the trip, rather than inconveniences because of the trip. It also helped that Grimace, Aunty @atlasandtracks And I were able to rotate supervision/meeting needs of those young’uns. Whilst we didn’t get to explore any of the walks around the campsite, I feel like a had a good dose of nature – I’m feeling reconnected to land, disconnected from the digital world and closer than ever to my family. 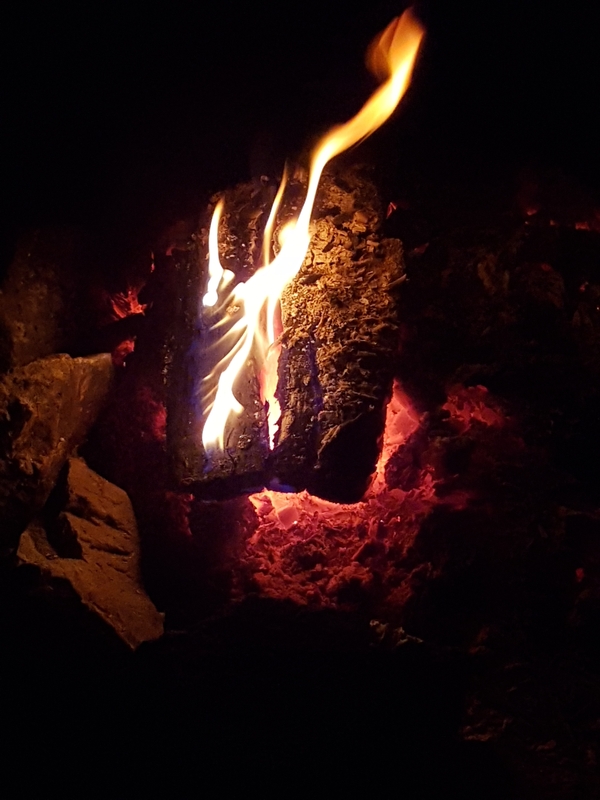 Sitting around a fire or waiting for the water to boil are just a few of the moments I will savour from the trip. 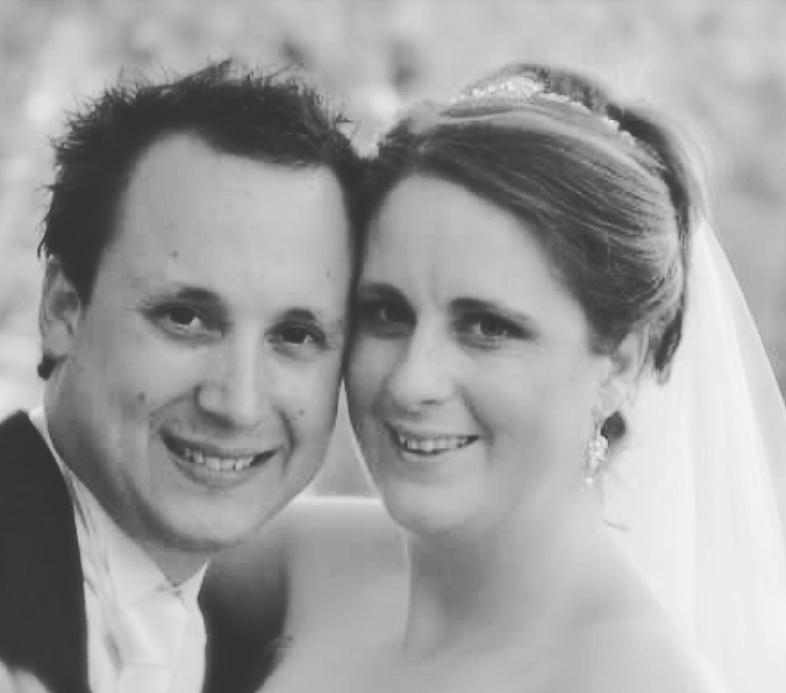 Yesterday marked 9 years since Grimace and I tied the knot. I still don’t believe I’m old enough to have been married 9 years…I still think of myself as 25 and that the wedding was just last year. Alas, I’m getting further and further away from age 25, as I suppose the calender cannot lie. 12 April 2008 was a glorious day in Mudgee – prime NSW wine country. The autumn sky was a pristine blue and the falling leaves were various bright colours. The morning and evening were quite cool, but there was considerable heat through the day. I don’t really remember too many other minor details from the day – Mostly, I recall an overall buzz of excitement; that and the scene was set for us to make the vows…promise I remember that bit! At the time, the wedding felt like THE most important thing to have taken place in my life (it probably still is), but all those details Grimace and I worked so hard to plan, barely register now – I could not tell you what food we served at the reception, what time it all took place or what bugged me about the accommodation we stayed at. What I can tell you is: we felt incredibly happy, the food and wine were amaze, our friends and family made us feel super special, the music was remarkable and that Mudgee was a beautiful place to have it all happen. It’s these things that seem to continue to resonate in my life with Grimace – all the day-to-day planning a family needs is sometimes overwhelming in the moment, but we eventually survive, and find all the happy moments from that experience to remember how solid we are. Family, friendships, food, music and adventuring – we do always seem to come out on top (eventually). It may not always be glamorous or endearing Grimace, but I love finding these happy moments with you by my side.